It has been a very dry autumn and early winter around these parts—but that finally changed as a winter storm moved across the area yesterday and today. On Tuesday afternoon clouds began to increase across the area and there was a cap cloud draped across the San Francisco Peaks. 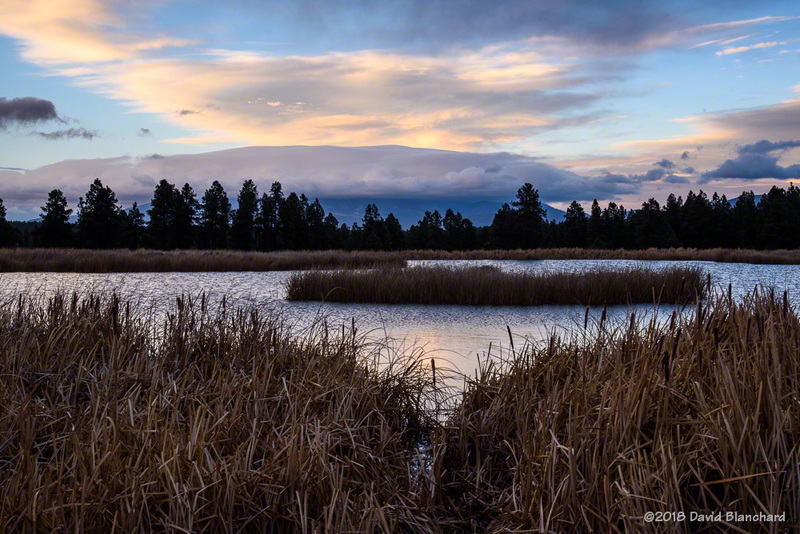 Clouds cover the San Francisco Peaks as a winter storm approaches Arizona. Most, but not all, of Arizona received precipitation including Flagstaff. We have been without any significant precipitation since September 27 when 0.07″ of rain fell. Since then, we’ve had 0.01″ on November 17 and a Trace on December 21. That’s it. It’s been the driest period on record and the second latest first snowfall of the season. And it’s been warm. Water vapor satellite image of the winter storm approaching Arizona. Rain began to fall around 7:30 P.M. Tuesday evening then switched to snow around 10:15 P.M. as the cold front moved across the area. Prior to frontal passage we had several rounds of thunderstorms. At least one of these thunderstorms exhibited extreme right-mover characteristics as well as some weak rotation suggesting it may have been a supercell. 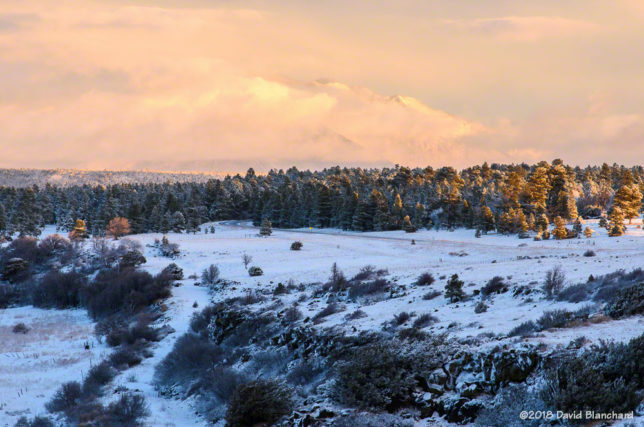 With this winter storm Flagstaff received ~5″ of snow and 1.19″ of total water. 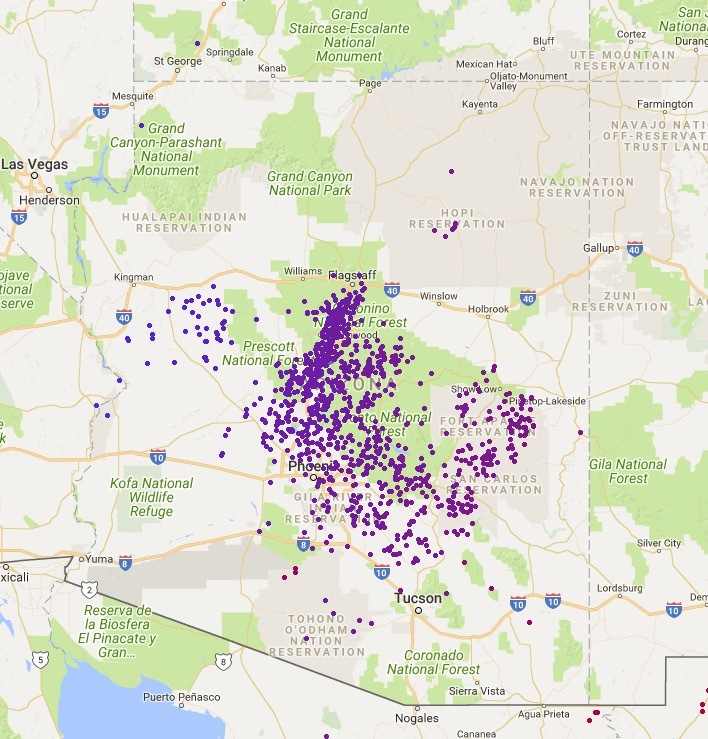 Location of lightning strikes as the cold front advanced across Arizona. Although it was still mostly cloudy this morning, there was a gap in the clouds along the eastern horizon allowing sunshine to briefly illuminate the peaks shortly after sunrise. San Francisco Peaks wrapped in early morning clouds. Mormon Mountain and Mormon Lake at sunrise. The San Francisco Peaks are almost completely wrapped in clouds with only the summits visible. A few minutes later, the sun had risen high enough that it was above the clear gap and everything turned gray again. This will be a short-lived episode as the forecast indicates a quick return to warm and dry conditions across the southwest.